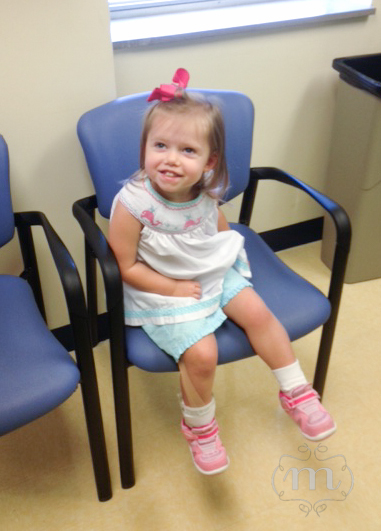 Yesterday was Anniston's annual cardiology appointment, and it went better than we could have anticipated. We really felt good about the appointment, but I will say that I did have to occasionally push away negative thoughts leading up to this visit. Were we going to leave this appointment crying and praying, like we have before? Have we had too many good visits? Was this the one? I truly didn't feel consumed by those thoughts, and Stan and I both overall were not worried (and did not have reason to be), but it was a tiny battle for me at the end... Truth is, those thoughts are not from God. Now, let me turn this update around and say that God outdid Himself again. Sweet, dear friends and family were lifting our family up, and He has proven faithful as always. One of our concerns was how Anniston would act...this is often a concern at doctor appointments :). She definitely was nervous as evidenced by the following picture (the above with a smile was captured after an extensive amount of silliness on our part as parents), but she was pretty easy to calm down, and she even walked up to her cardiologist at the end of the appointment as if to say "hey, you are welcome in my world"...which has rarely happened with any adult, much less a doctor. 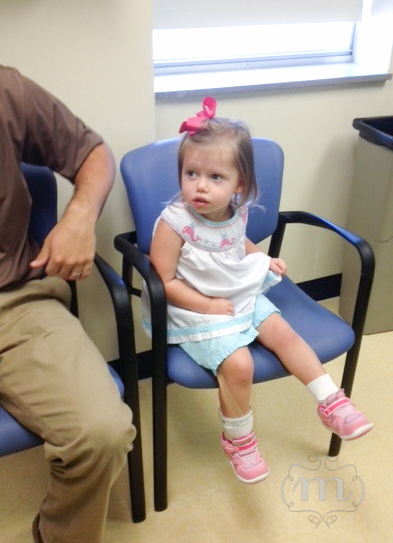 Okay, on to the important stuff: the doctor said that Anniston's heart looked just as great as it did last year. In fact, the gradient (pressure entering and exiting her heart) was the exact same number as last year, which is pretty crazy. I think her doctor would not have been surprised to see some residual narrowing of her aortic arch (it was not connected at birth, was connected via surgery, and later was "ballooned" after some narrowing post-surgery), at least over time as she grows, but the fact that it has not changed at all in a year and is still within a "normal" range is fantastic. Our doctor basically said that this evidence means that we would not ever have to be concerned about her heart in-between her yearly appointments. If there was any narrowing (which, we are claiming there will not be any! ), then it would not be anything drastic or noticeable. She said they would still want to keep an eye on it, of course, but her heart looks so perfect and is growing with her so well. A few months ago, I noticed Anniston getting a little tireder than normal when in the car, and the doctor said she shouldn't be tireder than other children due to her heart. (The tiredness most likely had to do with her drastic increase in mobility the beginning of this year, and I have not noticed any exhaustion in several weeks.) She even related her to typical children who get tired when beginning school, just like her son did. Stan said "she compared her heart to a regular child's!" ha. The nurse always takes her blood pressure in her arm and also in her leg to measure the pressure of her blood before it enters the heart and after it exits the heart. Dr said the pressure was higher in her leg, which is what yours and mine would be...praise Jesus!! * Oh and for fun, here was her appointment last year. WOW, she has grown. This is a video from today of her singing in the car...she LOVES to sing, and her speech is improving :). Praises to Jesus all around. In that first pic, I saw a bit of Jan in her face! Sooo exciting!!!! I could just eat her up! Umm, I'm pretty sure you just made Mrs. Jan's week, Camille! And thank you, Brooklyn...me too :). 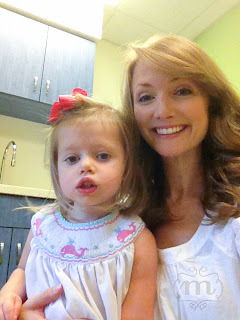 LOVE....LOVE this girl and hearing these wonderful reports! God is faithful!